﻿﻿﻿﻿﻿﻿﻿There’s more than one way to fillet a fish. ﻿﻿﻿﻿﻿﻿﻿﻿﻿﻿﻿﻿﻿﻿Fishing is a favorite outdoor activity for many Texans. And nothing tops off a day of fishing better than savoring a delicious meal of the fish you have just caught. While the catching and eating can be fun, cleaning fish is probably the least enjoyable part of the process. 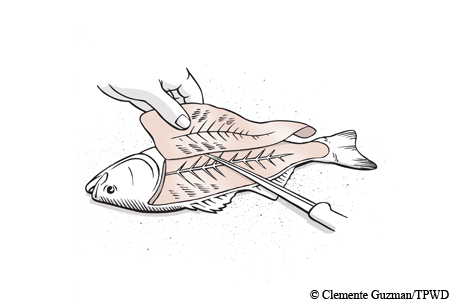 Filleting a fish simplifies cleaning by avoiding bones or innards. In general terms, cut just behind the head, down to and then along the backbone and ribcage, then out to the tail. Place the fillet skin-side down and slice the skin off. Keep the knife flat, applying downward pressure. Fish have a thin layer of red muscle right under the skin along the sides that help them swim. The more active the fish, the thicker the layer of muscle. This vascular muscle has a stronger taste than the white meat; you can avoid it when filleting if you don’t like that “fishy” taste. Some fish lend themselves to filleting better than others. Bass and crappie: These species fillet very easily and have no floating bones. A quick cut behind the head, down to the spine and out to the tail works nicely. Catfish: A simple fillet will miss quality meat on the top and side of the long skull. Carving out that chunk and then slicing down the spine gets more meat. Many peel the skin first by cutting slits high on the head, then pulling with pliers down to the tail. This lets you see the meat clearly. River and saltwater cats often have more red meat, but otherwise taste just fine. Carp: While carp are surprisingly one of the tastiest fish, their tough scales and rows of unattached Y-shaped bones can create issues. Fillet normally, then cut the fillet in half lengthwise so you have two long strips. On each strip, feel for a row of Y bones. Lay the strip so the Y is upside-down and cut down along each side of the Y, throwing out the middle portion with the bones. Saltwater: Marine fish do more swimming than freshwater fish, thus the red layer is typically thicker. If you don’t like that stronger flavor, you need to cut that away. Larger fish: Big fish don’t require a bigger knife. Cut the fillet from the back down to the spine, then from the bottom up to the spine, and finally, off the spine. Knives: There is no perfect knife or length. The most important factor is that the knife be very sharp. Stick with one type. If you change the type of knife you use, you’ll have to change your technique. Electric knives cut faster and let you cut right through the ribcage and hard scales, cutting the ribs away afterward. When all is said and done, the best way to get better at filleting is to do it more frequently, so go fishing!